Update Early 2015: I have since moved to a new boat, and have a Vesper XB-8000 AIS unit. The ACR Nauticast unit failed in 2012, and was replaced with another Vesper model. 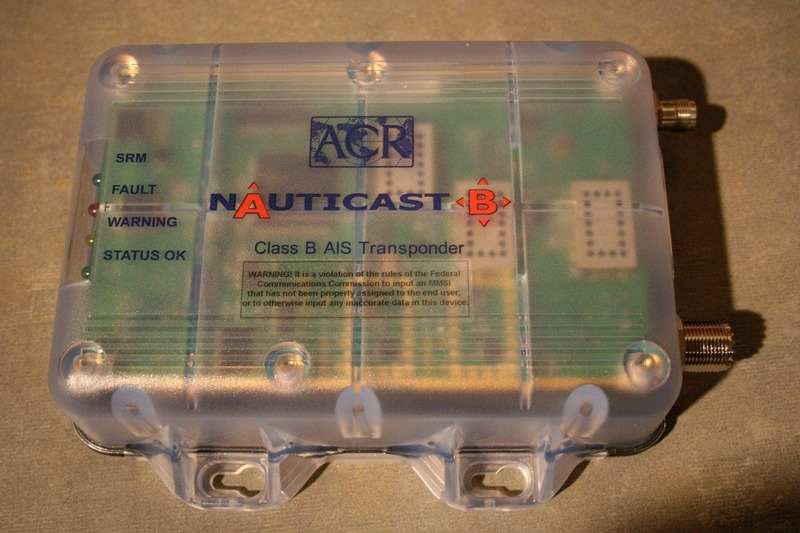 The final piece of my navigation and safety additions to my sailboat finally came in – an AIS Class B transponder. I chose the ACR Nauticast-B kit which includes a bunch of different things. This post contains a lot of information on unboxing and initial playing of the unit. I sail primarily near Elliott Bay in Puget Sound, Seattle, WA. My sailboat currently has an AIS receiver that I have had for over a year, and it has proven well worth the investment. I have it connected to my Garmin GPSMAP 5208 chartplotter, and shows a lot of details on ships moving around me. Elliott Bay is very busy – two major ferry routes terminate here, and there are countless cargo ships and cruise liners moving around. I wanted to go to the next level and have the ability to broadcast my location out via AIS-B so that those folks who choose to listen will see me. I like sailing in Puget Sound, and I think that this will be a key safety system in making sure others see me ahead of time as well. I purchased the unit through Milltech Marine – great folks with a lot of expertise in this area, and right in my backyard on Bainbridge Island. They processed the necessary paperwork, which included getting details on my boat, measurements where the GPS antenna will be installed, and of course my existing MMSI number. 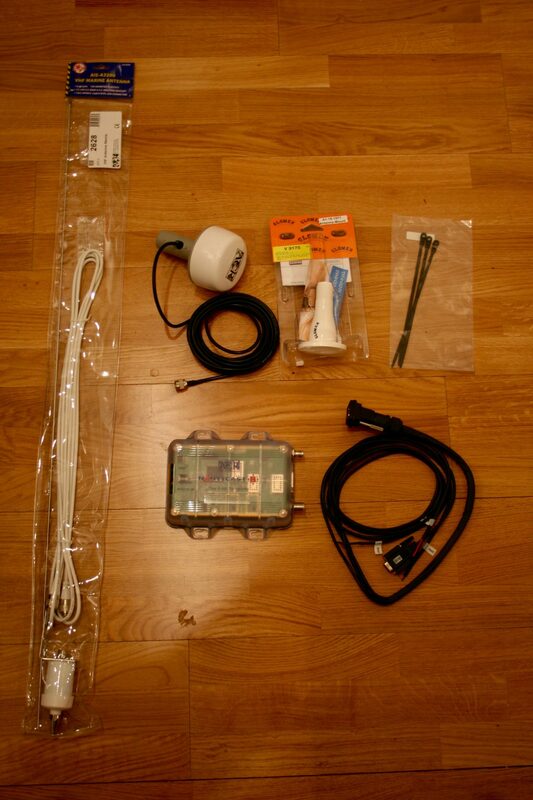 Cable from Nauticast to GPS, VHF, etc. One thing of note – I explored whether I could use my existing VHF splitter and antenna for this, but Doug at Milltech recommended that I not do that. There was a different setup I could put together, which I still may end up needing to do, but the preferred way is for the unit to have it’s own dedicated VHF antenna. Keep in mind that the system will be broadcasting your location and vessel details constantly, and sometimes frequently depending on your speed, etc. Sharing your existing VHF antenna could be problematic if you need to, say, make a VHF call for some reason. The VHF antenna looks to be decent quality. It’s an AIS branded antenna, whatever that means. It comes with a decent length of cable, and molded ends on both ends. That’s going to be a bit of an issue when snaking it through the various places and out aboveboards. It’ll likely get cut and have to be re-ended. It would have been nice had it come with a spare end, uncrimped and unconnected. I’d guess the antenna is about 3′ tall. It doesn’t come with a wealth of mounting options, but the base has the necessary holes and bracket to be mounted just about any way you’d like. The GPS antenna is an ACR branded model and comes with a Glomex mount base. The same goes here for both the cable and the base – the cable has the end on it, and the base has little mounting options included other than a flat surface. The transponder itself looks very well made – rugged and water proof with easy to see indicator lights, and cable connections. It has good lockdown screw holes around the unit, and is nicely compact so it can fit in some out of the way location. 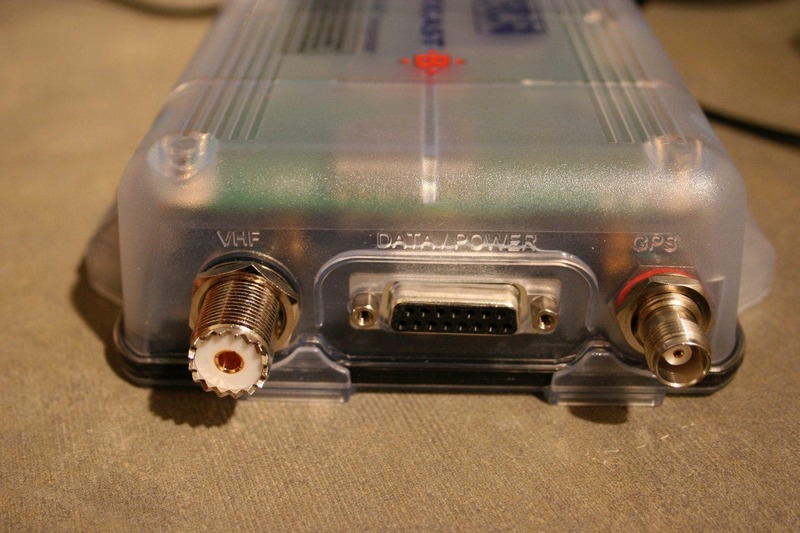 There are three connectors – one for VHF, one for GPS, and one large one for the interface cable. The interface cable fits very snugly, and has very long screw-downs, along with a very tight waterproof seal. The cable itself has connections to power, RS432, RS232, and for a switch. After unboxing, I wanted to give it a test at home. I connected everything together, put the GPS and VHF outside, and powered up the unit. I had loaded the Link2AIS software provided by ACR, and connected things via the RS232 serial interface, and waited for a bit while the unit acquired GPS satellites. I was using my new Dell Mini 9 that I plan on having on the sailboat as my primary computer given it’s low power consumption and lack of moving parts. The Dell doesn’t have a serial port, but I had a Keyspan USB-serial adapter. Milltech sells these as well. The system came up pretty quickly, and using the Link2AIS software I was able to see vessels near me pretty quickly. There are a lot of really nicely thought out options in Link2AIS for configuring the unit, but the majority of it is not useful for actual route planning or looking at AIS targets. It’s a pretty basic application from that perspective. You can see some additional screen shots of the setup screens and positioning information in my set on Flickr. What I really wanted to play around with was Coastal Explorer, the navigation software I use. I fired it up, told it to discover my GPS, and it found the unit immediately. A few minutes later, I had a whole host of targets on the screen just as you would expect. I waited about 15 minutes, but I was never able to find my vessel on any of the online, web-based AIS tracking sites. I’m not sure if that’s because I was not waiting long enough, on land (! ), or because those sites only show AIS class A transponders. I think I can assume that I’m showing up on everyone else’s receivers based on the fact that the transmit light on the unit was going quite frequently, and the software indicated that it was working OK, and had my MMSI and all the appropriate details. 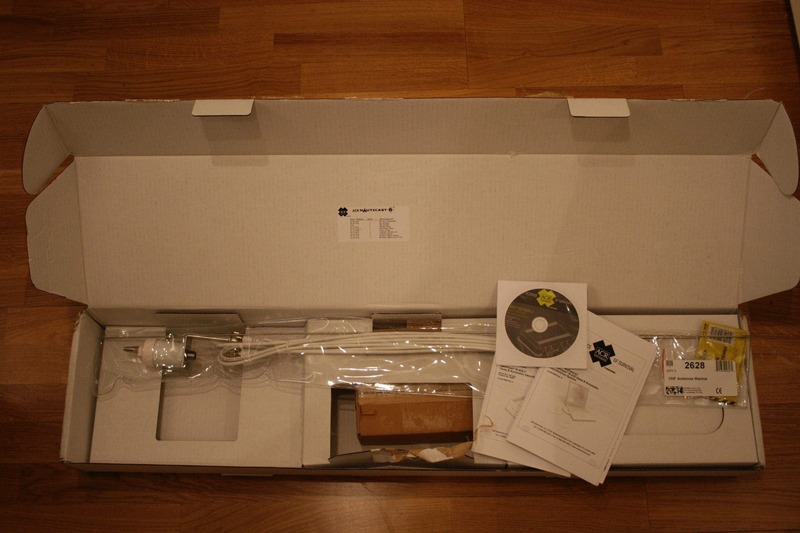 The unit is very well built, and included are the basic pieces to get you up and running. The software is solid, and has all of the features, and then some, to configure, maintain, and troubleshoot any problems you might have. The documentation is complete, thorough and very well written.